President William Howard Taft was our 27th President, as well as our 10th Chief Justice of the U.S. Supreme Court. He is the only person in history to have served in both of these offices, as well as being the only President to swear in two of his successors: Calvin Coolidge and Herbert Hoover. His Presidency was noted for its support of the economic development of Latin America, known as “Dollar Diplomacy”. The decisions of his court provided long lasting effects, such as Carroll v. United States, which allows for the search of a vehicle without a warrant if police have probable cause, and Olmstead v. United States, which referenced evidence gathered during a telephone wiretap. 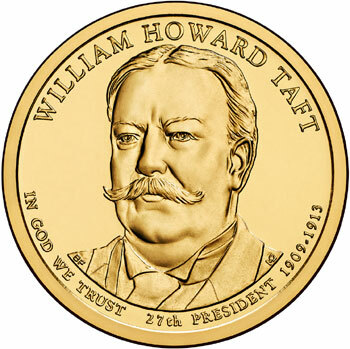 The coin bearing President Taft’s image is the twenty-seventh in the series of Presidential Dollar coins, and the third to be issued in 2013. The obverses depicts Taft, the time in office (1909-1913), and the motto “In God We Trust”. The reverse shows the Statue of Liberty in the same design as been depicted on all Presidential dollars. The edge has the motto “E PLURIBUS UNUM”, the year of issuance, and the mint mark.